Pope Adrian, or Hadrian I, (d. December 25, 795) was Pope from February 9, 772 to December 25, 795. He was the son of Theodore, a Roman nobleman. He reigned for longer than any Pope until the pontificate of Pius VI. He has been described as symbolizing the "the medieval ideal of union of church and state in a united Christendom" through his relationship with Charlemagne and did much to lay the ground for the creation, in 800 C.E., of the Holy Roman Empire.. He may have been the first Pope to refer to the Donation of Constantine, which purported to be the last will and testament of Constantine I. This may have been fabricated during the reign of Stephen II but it is referred to in a letter from Adrian I to Charlemagne dated 778;  This appointed the Popes to be successors to the Roman Emperor in the West which is the source of the papal claim to possess all authority on earth, temporal and religious and to be appointers of, and not appointees of, princes and kings. His harmonious relationship with Charlemagne, regardless as to who really enjoyed temporal precedence, remains a rare example of religion and the state working effectively to create a stable, orderly society. He also helped to mend bridges between the Eastern and Western churches, presided over the Seventh Nicene Council (786), repaired many Roman churches, rebuilt the City walls and gave generously to the poor. He was a popular Pope, who tried to serve society as well as God. He may have been the architect of the dogma that the Pope is the supreme political as well as spiritual authority but his concern was not so much power for the sake of power as the creation of a stable, moral and Christian society. However the legacy of this doctrine dominated European history for centuries causing national and international conflicts such as the Investiture Controversy. In the end it led to the strict separation of church and state or subservience of the church to the state. Very little is known of Adrian's early life. Born a patrician, he would have received a classical education and may have been marked from an early age for a career in the church. He was a clerk, a notary, a regional bishop, and then a cardinal-deacon, serving under Popes Paul I and Stephen III. Renowned for his piety, his election as Pope was a popular choice, one which Paul Afiarta, the representative of the powerful Lombard King Desiderius who saw the Pope as his personal nominee, could not resist. Soon after his accession, Adrian discovered that Paul Afiarta had either exiled or imprisoned a number of people accused of opposing Lombard ambition. He released them or secured their return. Meanwhile, Afiarta was in Lombardy denouncing the new Pope to Desiderius, who swore he would bring the Pope to his court at Pavia, in chains if necessary. Desiderius, who wanted to rule the whole of Italy, then set out to annex the Papal States, over which the popes ruled directly. Several cities fell to his advancing troops. Adrian immediately turned to Charlemagne, whose own father had been confirmed as King of the Franks by Pope Zachary, and who was considered an ally of the Papacy, to come to his defense. While he waited, Adrian prepared to resist the Lombard army. Charlemagne, in response, entered Italy with a large army and laid siege to Desiderius in his capital of Pavia. While his army besieged Desiderius, Charlemagne visited Rome where he celebrated Easter and was received with deep gratitude by Pope Adrian. By spring 774, Desiderius was defeated and exiled; Charlemagne had extended his own territory and claimed the title of King of the Lombards for himself. Adrian ratified this, and appointed Charlemagne a Roman patrician. Adrian regained control of the Papal States, although effectively as a Frankish protectorate. He also gained some additional territory: additions to the duchy of Rome, and to the Exarchate of Ravenna, and the Pentapolis in the Marches, which consisted of the "five cities" on the Adriatic coast from Rimini to Ancona with the coastal plain as far as the mountains. According to one source, the outcome of the first encounter between Adrian and Charlemagne was the "Donation of Constantine," in which the Pope claimed temporal sovereignty, which makes Adrian "the founder" of the concept of the "temporal authority of the Popes." The Popes had already adopted aspects of imperial ceremony associated with the Senate and magistracy. The document claimed to be dated March 30, 315. While Adrian needed Charlemagne's aid and protection, Charlemagne's own territorial ambitions could be legitimized if he enjoyed the Pope's blessing. 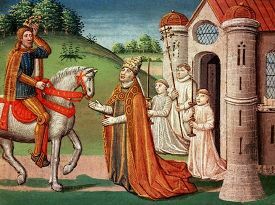 Subsequently, Charlemagne returned several times to defend his Italian possessions, as well as to protect the Papal States. He met Adrian on at least two more occasions. In 781, he visited Rome with his wife and his son, Pippin. On that occasion Adrian crowned Pippin king of Italy. In 787 Charlemagne visited Adrian while he was in Italy to discipline the duke of Benevento, who was resisting Papal authority (Charlemagne had given Benevento to Adrian in 773). Adrian has been described as one of the first Pope-Kings, and also as a king-maker. There is evidence, however, that Charlemagne, who would become the first Holy Roman Emperor in 800 C.E. under Pope Leo II, never "saw the Pope as more than a superior bishop," and regarded Adrian as a "state ecclesiastical functionary." If the Pope claimed to be the "residual legatee of the" Roman "empire in the west," as expressed in the Donation of Constantine, it seems that the Emperor regarded himself as the "head of the Church as well as head of the State." Charlemagne, however, is said to have truly loved him. Historian Paul A. Johnson suggests that at this time, it was believed that the end of one reign and the start of the next required sacramental intervention to "break the magic of the old line" and transfer this "to the new." As head of the church, the Pope was the senior sacramentalist, so who better to confirm a King's authority? If nominally this made the Pope superior, in reality Charlemagne knew that since the Pope needed his protection, he was "therefore inferior," whatever the Church itself taught. Adrian did much to improve relations between the Church in the West, and the Church in the East. He presided at the opening of the Seventh Nicene Council (786), transferred to Nice the following year. He promulgated teaching on the use and veneration of icons and supported the suppression of the iconoclasts. It was in connection with this controversy that Charlemagne commanded the writing of the Libri Carolini which opposed images. Adrian replied by letter, anathematizing all who refused to venerate the images of Jesus, the Virgin Mary, or the saints. Notwithstanding this, a synod was held at Frankfurt in 794 which condemned the practice, and the dispute remained unsettled at Adrian's death. However, the Council also endorsed the addition of the filioque (and the Son) clause to the creed, which later became a major issue between the Eastern and Western churches, with the former rejecting it. Adrian also opposed Adoptionism, the teaching that Jesus was born in the normal way, as a mortal man but was later adopted by God as God's son as a result of his righteousness. In 787, Adrian elevated the diocese of Lichfield, in England, to an archdiocese at the request of the English bishops and King Offa of Mercia in order to balance the ecclesiastic power between Kent and Mercia. He gave the Lichfield bishop Higbert the pallium in 788. Under his lengthy papacy, the internal administration of papal affairs was vastly improved, the "papal states were reorganized" and the "dignity and decorum" of the papal office were restored. Adrian repaired many Roman churches, decorated Saint Peter's Basilica, re-built the walls of the City and was renowned for his generosity to the poor. He restored some of the ancient aqueducts of Rome, and rebuilt the churches of Santa Maria in Cosmedin, decorated by Greek monks fleeing from the iconoclastal persecutions, and of San Marco in Rome. Adrian died on Christmas Day 795, having reigned as Pope for 23 years, ten months, and 24 days, which would stand as a record for the next one thousand years. An epitaph written by Charlemagne in verse, in which he styles Adrian "father," is still to be seen at the door of the Vatican basilica. Adrian I was a genuinely popular pope. Politically prudent, he ensured the survival of the papacy through his alliance with Charlemagne at a time when it was still vulnerable to manipulation and abuse. His aim does not appear to have been power for the sake of power, even if that was merely nominal, but the creation of a stable and moral Christian society. ↑ Adrian I Encyclopædia Britannica. Retrieved August 14, 2018. ↑ Donation of Constantine The Catholic Encyclopedia. Retrieved August 14, 2018. ↑ The Donation of Constantine Fordham University Medieval Sourcebook. Retrieved August 14, 2018. ↑ Pope Adrian I The Catholic Encyclopedia. Retrieved August 14, 2018. ↑ 5.0 5.1 5.2 5.3 5.4 Paul A. Johnson, History of Christianity. (NY: Atheneum, 1987. ISBN 0689705913), 170-174. De Montor, Chevalier Artaud, "Adrian I," The Lives and Times of the Popes. NY: The Catholic Publication Society of New York, 1911. Pope Adrian I - Catholic Encyclopedia. Adrian I - Encyclopedia Britannica. This page was last modified on 20 August 2018, at 22:01.